The Scapula is the bone that is most commonly referred to as the shoulder blade and connects the humerus to the collar bone. It is one of the three bones that comprise the shoulder joint. The bone is triangular, is nearly flat and has 2 surfaces, three processes, and three angles. The two surfaces of the scapula are called the Costal surface and the Dorsal surface. This side of the scapula is concave and the concave depression over most of its surface is called the Subscapular Fossa. One of the rotator cuff muscles, the subscapularis muscle, stems from this side of the bone. There is also a hook-like projection arising from the superolateral surface and is known as the Coracoid process. It is on this surface where the spine of the scapula resides. It divides the surface into the Supraspinous fossa and the Infraspinatus fossa. The scapula’s spine projects out to form the Acromion. There is also a surface of the scapula which faces towards the humerus, known as the Lateral surface. This surface is the location of the Glenohumeral joint and many muscles are attached to here. 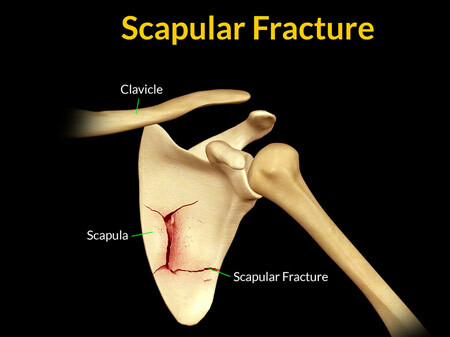 Fractures to the scapula are not a very common thing to be seen, in comparison with other fractures. In real life, they occur due to massive chest trauma caused by high-speed motor accidents, sports injuries or other injuries where the shoulder has been crushed as a result. If fractured, the Scapula does really require a lot of intervention as the family of muscles around exert enough pressure on the bone to have the pieces in the right place for proper healing. This is one of the conditions associated with the scapular that ought to be mentioned. There exists a muscle called the Serratus Anterior muscle which stems from the ribs 2-8 and is attached to the costal surface of the scapula thereby pulling it towards the rib cage. This muscle is controlled by the Long Thoracic nerve and if it gets damaged by any means, the scapula would stick out of the back when one tries to push with the arm. The thoracic nerve can be damaged by physical injury, repetitive shoulder movements or by the increased pressure exerted on it by the muscles that surround it.